Tendinitis (also called tendonitis) is an inflammation or irritation of a tendon, a thick cord that attaches bone to muscle. 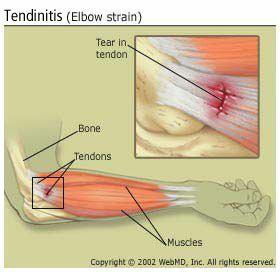 Tendinitis is most often caused by repetitive, minor impact on the affected area, or from a sudden more serious injury. An abnormal or poorly placed bone or joint (such as length differences in your legs or arthritis in a joint) that stresses soft-tissue structures. Stresses from other conditions, such as rheumatoid arthritis, gout, psoriatic arthritis, thyroid disorders, or unusual medication reactions. Overuse or doing too much too soon when the tendons aren't used to making a movement or doing the task taken on. Tendinitis is common in "weekend warriors," people that play and exercise hard only on weekends. Occasionally an infection can cause tendinitis, especially infection from a cat or dog bite to the hand or a finger. Anyone can get tendinitis, but it is more common in adults, especially those over age 40. As tendons age they tolerate less stress, are less elastic, and are easier to tear. Pain at the site of the tendon and surrounding area. Pain may gradually build up or be sudden and severe, especially if calcium deposits are present. Loss of motion in the shoulder, called "adhesive capsulitis" or frozen shoulder. How Can I Avoid Tendinitis? Take it slow at first. Gradually build up your activity level. Use limited force and limited repetitions. Stop if pain occurs. Do something else. Try again later and if pain recurs, stop that activity for the day. Corticosteroid injections. Corticosteroids (often called simply "steroids") are often used because they work quickly to decrease the inflammation and pain. Physical therapy. This can be very beneficial, especially for a "frozen shoulder." Physical therapy includes range-of-motion exercises and splinting (thumb, forearm, bands). Surgery. This is only rarely needed for severe problems not responding to other treatments. How Long Will Recovery From Tendinitis Take? Tendinitis may take weeks to months to go away, depending on the severity of your injury.